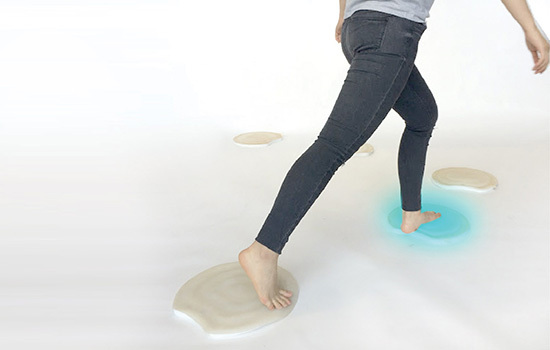 Lily Pad is just one of the innovations to come out of RIT’s Studio 930. A multidisciplinary collaboration between RIT and an international software company is opening new worlds for people through effective access technology and professional doors for students starting on their career paths. Life-changing innovations known as Otto, Lily Pad and Help Dress are just a few of the projects—emerging as solutions to challenges faced by children and adults with disabilities and special needs—that have resulted from the burgeoning relationship between the university and Autodesk, the San Francisco-based corporation widely recognized as the company behind the ubiquitous design software AutoCAD. “At RIT, we feel very fortunate that we can work with a partner like Autodesk that provides us with the tools that enable us to make an important impact on today’s society,” said Alex Lobos, associate professor and graduate director of industrial design in the College of Imaging Arts and Sciences’ School of Design. Rickel is faculty coordinator for Studio 930, a summer co-op in which RIT students develop projects from concept to prototype to commerciality. It’s part of the Albert J. Simone Center for Student Innovation and Entrepreneurship, which helps to advance student ideas and projects through business development programs, funding opportunities, student competitions and mentoring. A number of these projects are evolving into start-up companies such as ThermApparel, a garment with cooling technology that helps regulate body temperature for multiple sclerosis patients, which has an office at Venture Creations, RIT’s business incubator. The teams aren’t just made up of industrial design students; students in RIT’s engineering and multidisciplinary studies programs are benefiting as well. One of those platforms is Autodesk Fusion 360, the software company’s cloud-based 3D CAM/CAD tool. According to Lobos, who also uses the company’s software in his sustainability design courses, RIT students were asked to provide feedback on the alpha and beta versions. The company later flew RIT students to its offices in Portland, Ore., to meet with the product team and provide direct feedback. Since Lobos spearheaded RIT’s relationship with Autodesk in 2011, the collaboration has flourished. He has attended joint conference presentations with company executives, who have subsequently sponsored several multidisciplinary research projects at RIT. In addition to Smith, six RIT alumni now work for the company, whose executives have visited the Rochester, N.Y., campus and hosted the university’s board of trustees and other RIT guests during a West Coast trip last summer. RIT and Autodesk recently signed a memorandum of understanding agreement to work together even more.